Flower nails. Pink and white rhinestone flowers glittery / sparkly nails. Glue included. 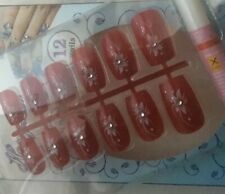 Hello there, Selling the 'Red False Nails With Designs And Stud. False 12 Artificial Red Nails With Glue.' Condition is New. Dispatched with Royal Mail If you have any questions, please do not hesitate to ask us! Thank you for looking at our nails, we have more nails on our page - Make sure to check them out too! Two nails in each size 0-9 will be included by default. APPLYING YOUR NAILS. Your nails can last up to 2 weeks depending on how they are cared for. You can also reuse these nails if they are removed carefully! Handpaintes Red And Gold False Nails Inc Glue. Condition is New. Dispatched with Royal Mail 2nd Class Large Letter. Hand Painted False Nails Inc Glue. Condition is New. Dispatched with Royal Mail 2nd Class Large Letter. ELEGANT TOUCH False Nails+Nail Saviour+ Glue. Velvety Rose And Glowing Apricot. Try our new Glue Pad range! Use this nail tip glue to give your nails the perfect hold. Laval 100 Salon Tip Nails. Saffron Pearl False Nails - Various Colours Available Pick Yours. ::Mix Match Makeup: We hope that you are delighted with your order. Clothes and Accessories Travel Accesories Health and Beauty Winter Party Accessories Sports Accessories Wallets. Faulty Goods 04-03-2018 21:59:43. Nails to stand out. designs and colours may vary. 1x french nails by invogue. 1x French nails by eyecandy. 1x French Parallel line nails by eyecandy. For Best Results Apply A Thin Coat Of Glue To Your Natural Nail Working From The Cuticle Outwards In Even Strokes. It can Also be used to strengthen and repair Natural Nails. Type:Fake Nails. 24 Pcs/Set x Foot Fake Nails. Just take out the desired size and stick onto you nail with the glue provided. Material:Acrylic Glue(2g). Perfect for easy & instant nail decoration. Create you own Nail Art in just a minute! 24 DESIGNER FALSE NAIL EXTENSIONS WITH GLUE INCLUDED. Without harming your nails. Nail glue net weight: 10 g. 6 pcs Nail Glue. Creating fantastic shiny nail effect. It can Also be used to strengthen and repair Natural Nails. Every monitor will display colour differently based on the hardware and settings. in comparison to the normal Tilt and Squeeze applicator. (Glue does not harm your nails and skin, but it will dilute fake nails.). Apply a proper amount of cotton soaked in nail remover to the nails. Do not expose the nails. Wrap them in plastic wrap and wait for about 15 minutes to remove them.